Once again our Nottawasaga Model Railway club had its exhibition layout on display at the Midland Show in Ontario, Canada in 2014. When I could take a break from operating the layout I wandered around to see what was new. The Lindsay group had travelled to Midland that year. They have a good looking, fine-running modular model railroad. Serval youngsters had set up a layout made with Lego that was running. the last time I saw a Lego display was at Trainfest in Milwaukee. This is the first time I've seen one operating at any of our shows. It is quite amazing to see and is a big attraction for young people at model train shows. There was also a small model railroad in N scale that featured some excellent animation. I didn't have an opportunity to talk to the creator who was explaining to an attendee how he made some of the animation. I hope he is at the Brampton Show this autumn. 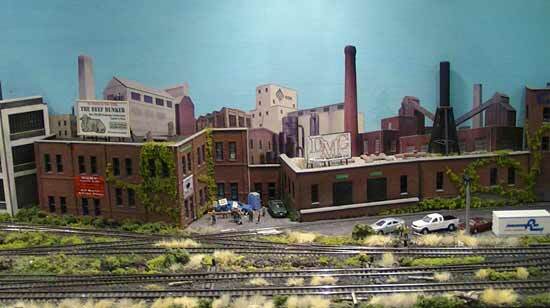 The Credit Valley and Soper Valley modellers joined their free-mo models together for a large display. There have been a lot of additions and upgrades during the past several years and their ever-expanding efforts were on display at the Midland Show. Here's a video of these layouts at the Midland show. Other groups from the region were attending as usual. The Barrie group is working on a new layout. John Brown's superb harbour scene was set up again at the Midland Show. The Midland gang were also well represented as is to be expected seeing as they host the show. (The luncheon spread for exhibitors was marvellous as usual. The gals do a great job.) The Scarborough guys were there with their layout as were the G scalers. I haven't mentioned everyone. Unfortunately, it was a beautiful day outside after a long run of nasty weather. This affected attendance as it seemed to be quite quiet on both days compared to other years. Hopefully the vendors were not too disappointed. I think they get most of their sales from the exhibitors instead of show attendees so they may have made out alright although I did overhear some grumbling. We'll keep our fingers crossed for next year. 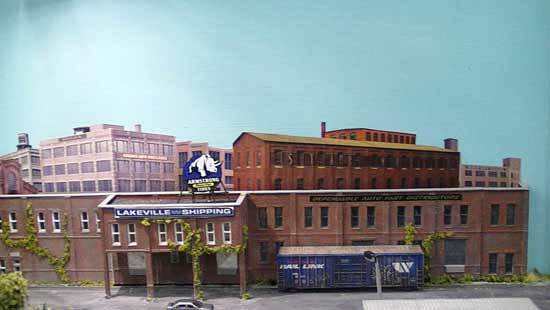 There was also a terrific narrow industrial n-scale layout about 8 feet long that shows how much can be accomplished in a small space. 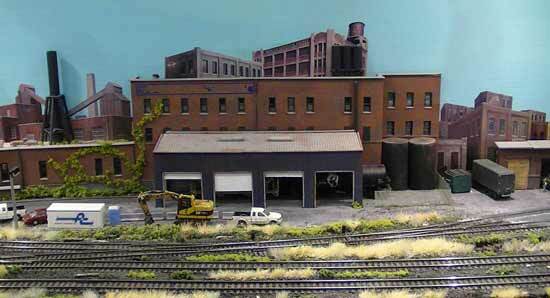 It makes me want to try building an n-scale layout again. I don't know the name of the modeller. I took a series of overlapping still photos from left to right to capture the overall model railroad. Go from "midland-show" to the Train Still Photos Gallery. 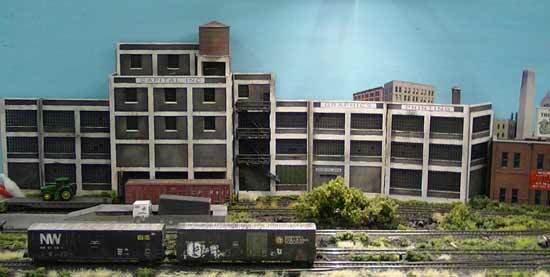 Go from "midland-show" to the Nottawsaga Model Railway Club page. Return from "midland-show" to my Home Page.